The classroom is still king in terms of spending for training, despite ever-increasing options that are seen as more effective, according to Brandon Hall Group’s 2016 Training Benchmarking Study. Training is often one of an organization’s biggest budget line items. With business needs changing quickly and technology advancing even faster, companies are constantly reevaluating how they spend their training dollars. It also can be difficult to determine just how big the training function should be related to a company’s size and the industry in which they operate. Actual budget sizes vary widely and depend on numerous factors, the most influential being the sheer size of the organization. Although it is a much sought-after piece of data, the actual size of the training budget doesn’t mean much. What’s truly important is how it is developed, who owns it, and how it gets used. Key findings in our 2016 Training Benchmarking Study provide a look under the hood of the training budget to get a better picture of what is really going on. More business leaders have primary responsibility for learning budgets than CLOs/heads of learning. E-learning is the most expensive learning experience to develop, and video learning is the least expensive. But e-learning is utilized 28 percent more often. 58 percent of organizations spend more than $1,000 per learner on training for senior leadership—compared to just 39 percent for high-potentials and 32 percent for mid-level management. 1. There is a four-way battle for control of the budget. It would seem obvious that the head of the Learning function ultimately would be responsible for the training budget, but many organizations do not have a Learning function, let alone a head of Learning. In many cases, training is carried out as a function of another group altogether, such as HR. The survey data shows that budget development is almost as likely to belong to someone outside of Learning as it is to reside with a CLO or equivalent. So while approximately half of the learning budget is managed by Learning or HR, in another 40 percent of organizations, responsibility rests with business leaders. Training budget development is important because the party responsible for developing the budget has a huge impact on how it is allocated. A CEO may have a much different view of the learning strategy than the head of HR, and business leaders may be able to keep the budget more aligned with the overall business strategy. 2. Video is the least expensive content to create. A traditional measurement of training is the amount it costs to develop one hour of training, but we are now in an environment where learning is not delivered in hours, but in experiences. These experiences vary widely, including multiple days for an in-person instructor-led training program, several hours for an e-learning course, and mere minutes for a video. To better reflect this model, our study asked organizations how many hours it takes to create a given experience. We then can cross-check this with the hourly cost of creating training to get a rough idea of what it costs to create various learning experiences. The study found that the average hourly cost to develop any kind of training is about $507, which includes headcount, technology, external resources, and anything else required to create the experience. An e-learning course ends up being the most expensive asset to create, requiring an average of 106 hours to put together, which results in an average cost of $53,742. On the other end of the spectrum, a video takes an average of 60 hours to put together, resulting in an overall average cost of $30,420. 3. Companies spend the most on training senior leaders. Overall, organizations tend to use a “trickle-down” approach when they leverage their training dollars. 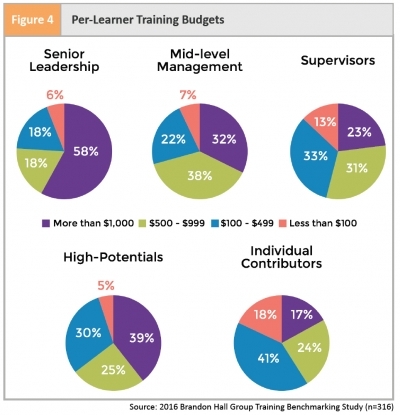 When we look at per-learner training budgets, we see that companies clearly are spending more money ($1,000-plus per learner) on senior leadership, and generally spend less at the lower manager and employee levels. The biggest budget band for senior leadership is more than $1,000 per learner per year, with 58 percent of companies spending that much. Some 39 percent of companies spend $1,000-plus per high-potential employees. Only 17 percent spend that much annually per individual contributor. There are always going to be more individual contributors within an organization than senior leaders, but the disparity between the spending amounts is quite significant. But training for any employee group is not necessarily cheap, as few companies spend less than $100 per learner for any type of employee. 4. The classroom is still king—in spending, not effectiveness. Technology has provided learning with more delivery options than ever before. Social media tools, mobile devices, HD video, and more have dramatically expanded the breadth and depth of the learning ecosystem. However, at the center of all this remains the classroom. And instructor-led classroom is still the predominant way learning is delivered—by a wide margin. On a five-point rating scale where 1 is 0 percent of total training and 5 is more than 75 percent, instructor-led classroom rates a 3.4—21 percent more than even e-learning modules, which rated a 2.8. What’s remarkable about this is that the level of effectiveness for each method outpaces the level of use, often significantly. 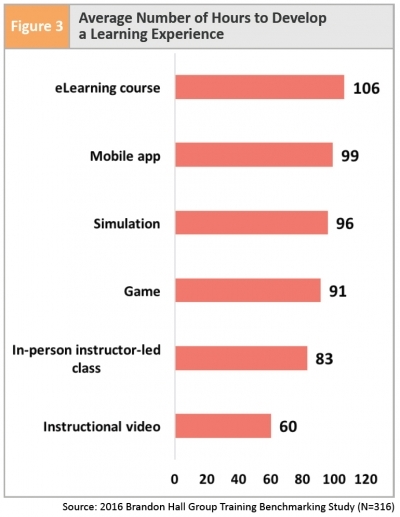 As stated, instructor-led training has the highest use rating, and it also has one of the highest effectiveness ratings. Yet, it is not the highest rated for effectiveness. That honor belongs to coaching and mentoring, yet its use rating is almost a full point below that of classroom training. It’s a similar story for on-the-job exercises. 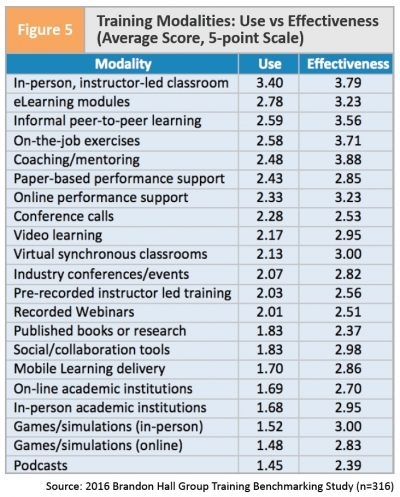 Modalities such as in-person games and simulations also score relatively high for effectiveness, yet they are at the bottom for use. 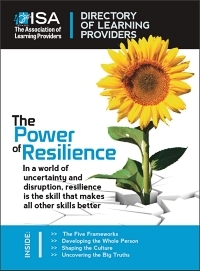 The bottom line is that organizations are discovering that there are many more effective methods available to them, but they have yet to break out of the formal classroom model enough to take advantage of them. 5. Technical skills training consumes the most training hours. Aside from pure cost, the biggest resource associated with training is time. People need to spend at least some amount of time away from their everyday duties to take training each year. It turns out that technical skills training requires the biggest commitment. At approximately one-third of companies, people are spending more than 10 hours per year in technical skills training. By way of contrast, people spend that much time with leadership training at only 23 percent of companies. Ethics and HR compliance take the smallest chunk of annual training dollars, while product and services knowledge training is right up there with technical skills. David Wentworth is principal Learning analyst for Brandon Hall Group, a human capital management (HCM) research and advisory services firm that provides insights around key performance areas, including Learning and Development, Talent Management, Talent Acquisition, Leadership Development, and Workforce Management/HR. The company’s mission is to empower excellence in organizations around the world through its research and tools each and every day. The company also offers strategic consulting, runs a global awards program, and produces the annual HCM Excellence Conference (Jan. 24-27, 2017, in Palm Beach Gardens, FL).